… born on May 3rd, 1919, he was 94–years-old when he died. peacefully in his at New York Presbyterian Hospital, where he had been a patient for six days. 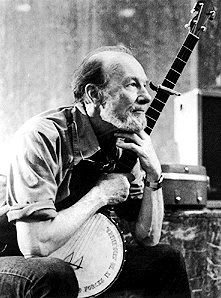 Peter "Pete" Seeger Seeger was born in Manhattan, New York. His family history dated back to the American revolution. 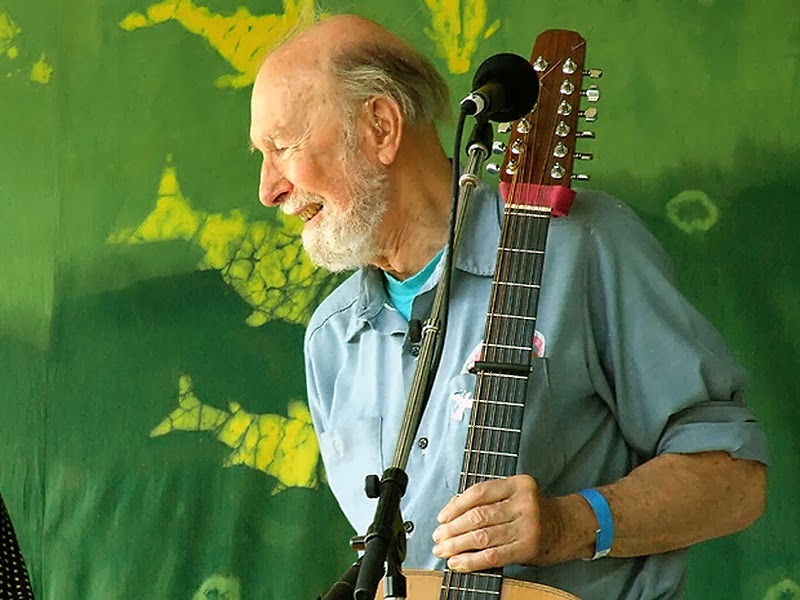 Pete's father, the Harvard-trained composer and musicologist Charles Louis Seeger, Jr., established the first musicology curriculum in the U.S. at the University of California in 1913, helped found the American Musicological Society, and was a key founder of the academic discipline of ethnomusicology. Pete's mother, Constance de Clyver Edson, raised in Tunisia and trained at the Paris Conservatory of Music, was a concert violinist and later a teacher at the Juilliard School. In 1912, Charles Seeger was hired to establish the music department at the University of California, Berkeley, but was forced to resign in 1918 because of his outspoken pacifism during World War I. When Pete was eighteen months old, the family lived in a trailer and embarked on a mission to bring music to the working people in the American South. Upon their return, Constance taught violin and Charles taught composition at the New York Institute of Musical Art (later Juilliard). 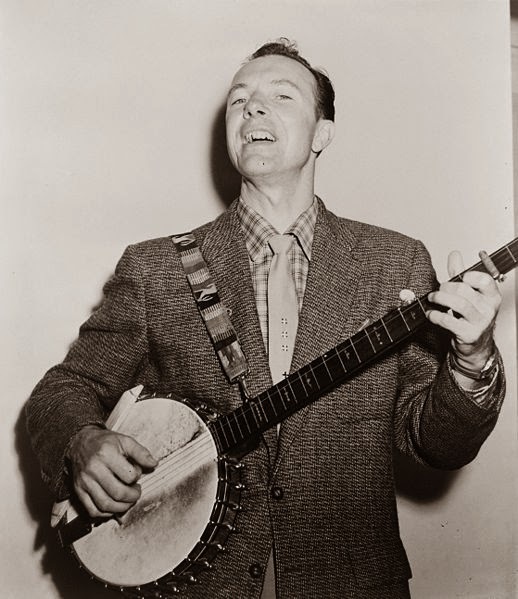 During the summer of 1936, Pete heard the five-string banjo for the first time at the Mountain Dance and Folk Festival in western North Carolina. He spent much of the next four years trying to master the five-string banjo. 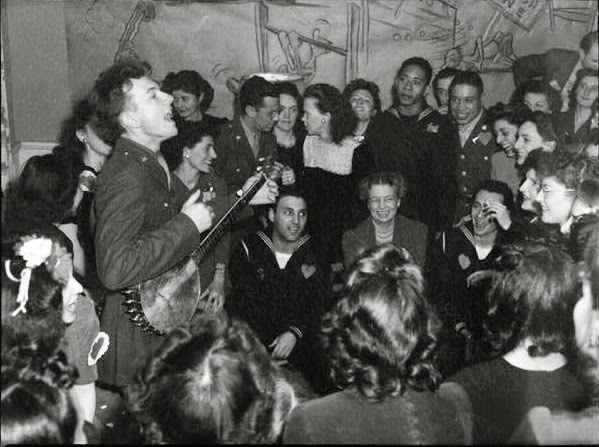 The teenage Seeger also sometimes accompanied his parents to regular Saturday evening gatherings in Greenwich Village. A fixture on nationwide radio in the 1940s, he also had a string of hit records during the early 1950s as a member of The Weavers, most notably their recording of Lead Belly's "Goodnight, Irene,” which topped the charts for 13 weeks in 1950. Members of The Weavers were blacklisted during the McCarthy Era. In the 1960s, he re-emerged on the public scene as a prominent singer of protest music in support of international disarmament, civil rights, counterculture, and environmental causes. Seeger was kept off commercial television for more than a decade after tangling with the House Un-American Activities Committee in 1955. 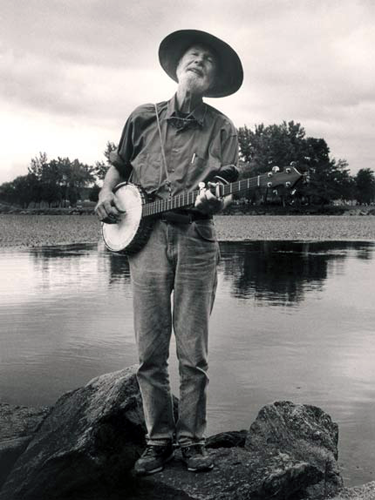 Repeatedly pressed by the committee to reveal whether he had sung for Communists, Seeger responded sharply: "I love my country very dearly, and I greatly resent this implication that some of the places that I have sung and some of the people that I have known, and some of my opinions, whether they are religious or philosophical, or I might be a vegetarian, make me any less of an American." He was charged with contempt of Congress, but the sentence was overturned on appeal. As a song writer, he is best known as the author or co-author of "Where Have All the Flowers Gone?" (with Joe Hickerson), "If I Had a Hammer (The Hammer Song)" (composed with Lee Hays of The Weavers), and "Turn, Turn, Turn!,” which have been recorded by many artists both in and outside the folk revival movement and are still sung throughout the world. "Flowers" was a hit recording for The Kingston Trio (1962); Marlene Dietrich, who recorded it in English, German and French (1962); and Johnny Rivers (1965). "If I Had a Hammer" was a hit for Peter, Paul & Mary (1962) and Trini Lopez (1963), while The Byrds popularized "Turn, Turn, Turn!" in the mid-1960s, as did Judy Collins in 1964 and The Seekers in 1966. Seeger was one of the folksingers most responsible for popularizing the spiritual "We Shall Overcome" became the acknowledged anthem of the 1960s American Civil Rights Movement, soon after folk singer and activist Guy Carawan introduced it at the founding meeting of the Student Nonviolent Coordinating Committee (SNCC) in 1960. ... he was 74-years-old when he died from chronic obstructive pulmonary disease. The Everly Brothers - Phil and Don - are country-influenced rock and roll performers, known for steel-string guitar playing and close harmony singing. The brothers are the most successful U.S. rock and roll duo on the Hot 100. Their greatest period came between 1957 and 1965. The duo's harmony singing had a strong influence on rock and roll groups of the 1960s. The Beatles, The Beach Boys and Simon & Garfunkel developed their early singing styles by performing Everly covers. Don was born in Powderly, Muhlenberg County, Kentucky, and Phil two years later in Chicago, Illinois. Their father, Ike Everly, was a musician. Ike Everly had a show on KMA and KFNF in Shenandoah, Iowa, in the 1940s, with his wife Margaret and two young sons. Singing on the show gave the brothers their first exposure to the music industry. The family sang together live and traveled in the area singing as the Everly Family. As the brothers transitioned out of the family act and into a duo, family friend Chet Atkins became an early champion of The Everly Brothers. Despite Atkins' affiliation with RCA Records, it was Atkins who engineered a chance for The Everly Brothers to record for Columbia Records in early 1956. However, their first and only single for the label, "Keep A' Lovin' Me," was a flop, and they were quickly dropped from Columbia. Atkins still encouraged the Everly Brothers to continue on, and introduced them to Wesley Rose of Acuff-Rose music publishers. Impressed with the duo's songwriting talents, Rose told them that if they signed to Acuff-Rose as songwriters, he would also get them a recording deal. The duo signed to Acuff-Rose in late 1956, and by early 1957 they signed a record deal with the new Cadence Records label. The Everlys entered the recording studio for their first Cadence session in February 1957. Their first Cadence single, "Bye Bye Love," had been rejected by 30 other acts - including Elvis Presley - but the Everlys saw potential in the song. Their recording of "Bye Bye Love" reached #2 on the pop charts behind Presley's "Let Me Be Your Teddy Bear," hitting #1 on the Country and the R&B charts. The song became the Everly Brothers' first million-seller. By 1962, the Everly Brothers became stalwarts of the Cadence label. The duo had hits in the U.S. and the U.K., the biggest being "Wake Up Little Susie," "All I Have to Do Is Dream," "Bird Dog" and "Problems." The Everlys also found success as songwriters, especially with Don's "('Til) I Kissed You," which hit #4 on the US pop charts. The brothers toured extensively with Buddy Holly during 1957 and 1958. According to Holly biographer Philip Norman, they were responsible for the change in style for Holly and The Crickets from Levi's and T-shirts to the Everlys' sharp Ivy League suits. Phil Everly was one of Buddy Holly's pallbearers at his funeral in February 1959. After three years on the Cadence label, the Everlys signed with Warner Bros. Records in 1960, for a reported 10-year, multi-million dollar deal. They continued to have hits for Warner Brothers and their first, 1960's "Cathy's Clown" (written by Don and Phil) sold eight million copies, making it the duo's biggest-selling record. Other successful Warner Brothers singles followed, such as "So Sad (To Watch Good Love Go Bad)," "Walk Right Back," "Crying In The Rain," and "That's Old Fashioned" (their last Top 10 hit). From 1960 to 1962, Cadence Records also continued to release Everly Brothers singles from the vaults: these included the top ten hit "When Will I Be Loved" (written by Phil) and the top 40 hit "Like Strangers," as well as lower-charting singles. However, shortly after signing with Warner Brothers, the Everlys fell out with their manager Wesley Rose, who also administered the Acuff-Rose music publishing company. Consequently for a period in the early 1960s, the Everlys were shut off from Acuff-Rose songwriters. With proven sources of hit material unavailable, from 1961 through early 1964 the Everlys recorded a mix of covers and songs by other writers. Their last U.S. Top Ten hit was 1962's "That's Old Fashioned" and succeeding years saw the Everly Brothers selling many fewer records in the U.S.. Their enlistment in the United States Marine Corps in November 1961 also took them out of the spotlight. After the Marine Corps, the brothers resumed their career, but U.S. chart success was limited. Of the 27 singles the Everly Brothers released on Warner Brothers from 1963 through 1970, only three made the Hot 100, and none peaked higher than #31. Their star had begun to wane two years before the British Invasion in 1964 — although their appeal remained strong in Canada, the United Kingdom, Australia and elsewhere. Towards the end of the 1960s, the Everly Brothers returned to an emphasis on their country-rock roots, and their 1968 album Roots is touted by some critics as "one of the finest early country-rock albums." In 1986, the Everlys were among the first 10 artists inducted into the Rock and Roll Hall of Fame. During the ceremony, they were introduced by Neil Young, who observed that every musical group he belonged to had tried and failed to copy the Everly Brothers' harmonies. In 1997, they were awarded the Grammy Lifetime Achievement Award. In addition, they were inducted into the Country Music Hall of Fame in 2001 and the Vocal Group Hall of Fame in 2004. Their pioneering contribution to the genre has been recognized by the Rockabilly Hall of Fame. The Everly Brothers have a star on the Hollywood Walk of Fame. In 2004, Rolling Stone Magazine ranked The Everly Brothers #33 on their list of the 100 Greatest Artists of All Times. They are also #43 on the list of UK Best selling singles artists of all time.